Python is one of the famed programming languages and is used in many fields such as the development of games, backend web servers, and others in the midst. It is a general-purpose, object-oriented, interpreted, and Python is considered as a reliable general purpose language and is also been a must-have tool for any coder. Python has exploded in recent years in the programming area amongst many programmers. Since the language is easy to discover, use and is a powerful language, it is used by many developers for a number of roles. 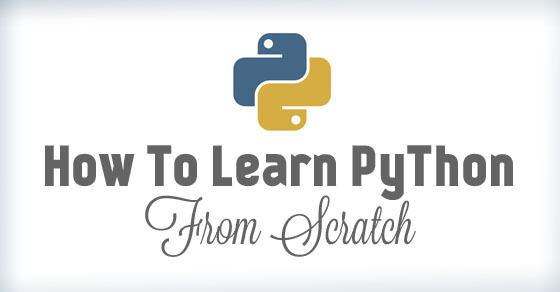 Let’s glimpse through a few points about how to learn Python from scratch. It is quite simple to install Python, systems that have windows also come with Python installed. In order to install Python for Windows system, the Windows Python interpreter can be downloaded from the Python website. Installing the right version appropriate to the operating system is mandatory. Linux and OSX have Python already installed in it, here Python software isn’t required but a text editor is required. The Python interpreter is one which requires being installed without changing the settings. Python can also be associated with command prompt by facilitating the last module in the list of modules. Python programs are ones that are developed on notepads or text edits, but a specialised text editor can be the right choice which makes reading and writing the Python code easier. There are a number of free python editors that can be picked from where a few of them are Text Wrangler (Mac), Notepad++ (Windows) or JEdit. Once you have installed Python, you can check the same by opening the command prompt and typing Python. By this way, Python is loaded and its version number is displayed. Learning of Python language can be initiated from online sources as there are many in number. Python tutorials for beginners are the best way which makes learning the language easy, simple and clear. Look for beginners guide for Python as you’re new to the language. Also, aspirants can browse through the number of introductory best Python books that are available online. All these books deal with the Python basics. Sample codes on various sites are another way to practice the basics of Python. By practising sample codes, new codes can also be coded. Online Python documentation is the initial port of call for your language learning process. There are also many other brief tutorials that can be studied which offers basic knowledge about Python language and helps you get started. When you wanted to learn something specific, then there are abundantly possible resources and Python website is one. Python package index is available with Python website which also has a search page for searching the sources of Python linked information. To get and learn the basics, the learner has to learn the following topics. Few of them are variables and types, basic operators, Python lists, string formatting, conditions, loops, Python functions, basic Python string operations, dictionaries, Python classes and Python objects, Python modules and packages and a lot more. One who desires to learn coding can get through these topics online and excel in learning the language. Python is considered as one of the easy and efficient languages which are easy to learn. Almost all developers should be aware of Python language. There is a vast scope of Python in software development. The language is mature and supports everything that one can imagine. Python is best used in a number of integration tasks as numerous applications make use of Python as the main embedded scripting language. The scope for Python is more as it has a number of ready-made Python tools and is a perfect language for integration. Few Python examples are that 3D software like Maya makes use of Python for automation of small tasks and for other integration tasks like asset management and talking to the database. Python language is prominently used in web development and mainly on the back end side. Python has a good scope in future for more of web development projects as it has good iteration time, perfect integration with database and other web related standards, easy extensibility and more features. Examples of Python are that they are used in the drop box, Quora, Pinterest, and NASA. Python is used in data science space and is widely used by data engineers and scientists. Python is the famed introductory language in the United States universities. Python is made used for a number of aspects such as the development of web apps and desktop apps and also has tools that assist in data mining. Apart from all these the language famed amongst the academic community, for bioinformatics and scientific computing. Civilisation IV, Bit Torrent, Reddit, Google, Instagram and a lot more are developed with Python. Thus, Python has a very good scope in future for the development of a number of applications. Software engineers make use of Python as the main programming language for many apps. When Python certification for programming is considered, there are many such courses available. Classroom courses, as well as python online courses for the same, are available for a fixed duration of hours. The Versatile programming language is a perfect choice for making small ranged projects which are utilised in small scripts as well as in large systems. The certification program helps the aspirants to learn version control, unit testing along with suggested idioms and styles. Python 3.0 which is considered as the largest standard library of Python is also explored as it assists in a number of programming tasks. Problems and examples of real-world programming are covered in the certification of the Python course. Web applications are created making use of contemporary web application frameworks. A substantial, as well as an original software development project and portfolio, are developed. There are certain institutes or classes that offer Python programming certification courses as few sessions. In that manner they start with basics of Python for few weeks, move on to Python data structures for few weeks, the course leads to navigation to web data with Python, making use of databases with Python and finally the course ends with processing, retrieving and visualization of data with Python. These paid programs can be started by paying per course or for the complete course. Once the course is completed successfully, a certificate is awarded. The course guides the students to make use of free open source PyScripter IDE for Python or Python IDE, they also help students write basic programs utilizing concepts such as variables, functions, loops, If-Else statements, While loops, recursive statements, iterative programs and also with few algorithms such as Insertion Sort algorithm. The certificate course will be of great use to ones who wanted to have a thorough understanding and knowledge of the basics of Python programming language. Ones who are good at programming through various courses and online sessions can develop small applications with Python and can post them on the open hub or GitHub. By this way, other well-versed Python programmers would see and reply you. There are many Python groups in Facebook, stack overflow, LinkedIn, and other social media sites. There are many questions posted and when you answer those questions, then there are many chances to update your knowledge and gain a job too. There are few companies that host online and offline test for coding which can help you learn Python. In the same manner, one can get linked to community people and coding groups of your place. The average salary for Python developers varies with the job role they hold in the United States. In that manner, a junior Python developer in the United States would receive an average salary of $62000. Python web developer in the United States would receive $476000 as an average. It would be $104,000 for senior Python developer and $92000 for Python developer. In this manner, the salary range differs according to the job roles they hold in the US. There is a huge demand for many Python developers these days. Hence, Python developers are always in high demand across the globe. There are a number of other factors that decide the salary of Python developer. The factors are geographic location, years of experience, product domain and more. It is important to remember that Python developers are highly priced and are recruited in masses if available. When a survey was conducted about the best programming languages to be learned in the year 2015, Python was one amongst the list. When the popularity of Python was analyzed in famed sites such as Stack Overflow and GitHub, Python appeared as best options amongst other languages. http://www.sitepoint.com/best-programming-language-learn-2015-job-demand-salaries/ shows the top ten demanded technologies which are mainly required for job advertisements and vacancies. This shows that Python is advertised by 5.5% of adverts with a salary range of $100,000. Python also falls under the list of being a technology which pays more than $100,000. Being the demanded and best-paid technology, it is mandatory for any programmer to learn Python for a number of reasons. Python is one of the easy to learn programming languages as the python codes that are 5 times less than Java and about 10 times shorter than C++. For job aspirants who desire to become a fully stacked programmer can start their travel from Python as it can be a stepping stone for becoming a well-versed developer. Amongst other programming languages, Python is one which is considered as the largest programming language in job demand growth. By January 2014, the demand for IT professionals dipped by 5% whereas for Python programmers it enhanced by 8.7%. Another interesting news about Python is that, in a survey in New York for the most demanded tech workers, Python programmers were ranked 8th which is mentioned in Reasons to Learn Python . Python programmers are always in high demand across the globe. Python programmers utilize their skills in web development and they have been the foundation for a number of sites such as The New York Times, Pinterest, BitBucket, The Guardian, and Instagram. In order to design your own website and applications, programmers make use of Python. With so many advantages Python can be the building blocks so that programmers can branch out and excel in other programming languages in the IT field. With Raspberry Pi which is a microcomputer for doing it yourself stuff, there are many do it yourself projects that can be tried. Hence, Raspberry Pi would guide you in a fun and exciting way in the utilization of Python programming. For ones who are keen on learning Python programming languages can check the courses online immediately and learn Python online. The course details either classroom or online sessions are mentioned above. Aspirants who wish to learn Python programming can run through the tips and make use of the same. Since there are more chances for Python developers, learning and excelling in the language can be of great usage. The salary details are also mentioned which gives a vague idea of the language and its demand in the present. More of Python programmers are in high demand and hence aspirants who wish to learn Python skill, can run through the syllabus and start Python learning. Python thus holds a special position in the programming field even today.